My veggie box has recently arrived containing a vegetable I had heard of only on cooking shows: the sunchoke also known as the Jerusalem Artichoke. I really had no idea what to do with this vegetable; so the first time it arrived I chopped it and put it in soup. The taste was similar to potato. 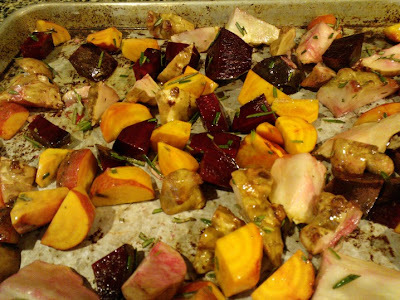 This time, I decided to roast it along with beets that came in the box as well. I added some olive oil and some fresh rosemary and salt. 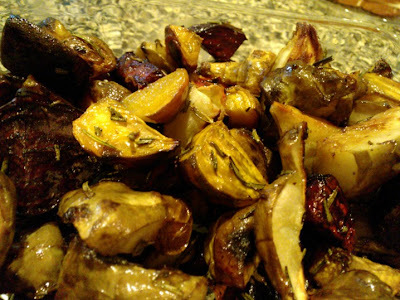 Let me tell you, roasting is the way to cook a Sunchoke! ...beets, too! Preheat oven to 410F. Scrub beets and sunchokes then cut into 1 inch pieces - no need to peel them! Put veggies into a bowl with rosemary, salt, pepper and olive oil. Massage oil and rosemary into veggies with your hands...or you can just use a wooden spoon to stir. Place veggies in a single layer on a cookie sheet and roast for about 40 minutes or until you can easily pierce the veggies with a fork.